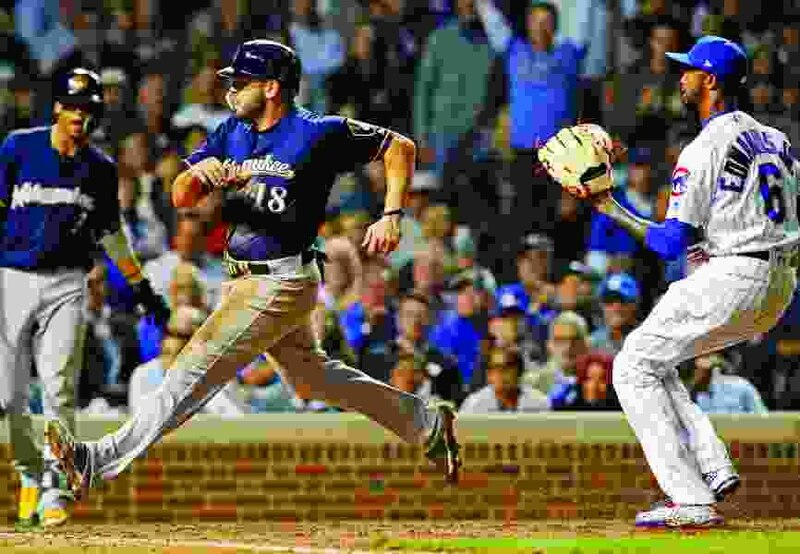 Chicago • Lorenzo Cain had four hits, Mike Moustakas scored on Carl Edwards Jr.’s wild pitch in the sixth inning and the Milwaukee Brewers beat the Chicago Cubs 3-2 on Monday night to pull within one game of the NL Central leaders. Wade Miley (4-2) pitched five effective innings before Corbin Burnes, Josh Hader and Jeremy Jeffress closed it out for wild card-leading Milwaukee. Back home after a soggy weekend in Washington, Chicago (83-60) lost for the fifth time in seven games. Ben Zobrist had two of the Cubs’ five hits, and Kris Bryant drove in a run. Willson Contreras doubled and advanced to third when Lester nearly drove one over Cain’s head in center field. Following walks by Addison Russell and Daniel Murphy, Bryant hit a sacrifice fly to left. Astros 3, Tigers 2 • In Detroit, Justin Verlander made it seem like old times at Comerica Park, drawing several big cheers and pitching seven sharp innings in his return to his former home while leading Houston over the Tigers. Verlander struck out 10 in his first game in Detroit since being traded to Houston in August 2017. The World Series champion Astros opened a three-game lead over Oakland atop the AL West. Verlander (15-9) made his major league debut with Detroit in 2005. Reds 10, Dodgers 6 • In Cincinnati, Scooter Gennett had four hits and three RBIs, Joey Votto hit a two-run double on his birthday and the Reds improved to 5-0 against Los Angeles this season. Eugenio Suarez added a solo home run for the last-place Reds, and Jose Peraza had two hits and scored three runs. That helped Cincinnati overcome Chris Taylor’s two-run homer and Yasmani Grandal’s solo shot. Rays 6, Indians 5 • In St. Petersburg, Fla., Ji-Man Choi hit a two-run homer off Brad Hand with two outs in the bottom of the ninth inning, and Tampa Bay beat Cleveland to set a team record with its 12th straight victory at home. Cleveland ace Corey Kluber was chased in the second inning, but the Indians rallied before blowing a late lead. Tommy Pham grounded a single to right field before Choi went deep against Hand (0-1). Cardinals 8, Pirates 7 • In St. Louis, Matt Adams hit a three-run homer in the eighth inning to rally the Cardinals over the Pirates. St. Louis, which overcame deficits of 4-0 and 6-4, moved two games ahead of the Los Angeles Dodgers in the race for the second wild card spot in the NL. Josh Harrison, Colin Moran and Starling Marte homered for Pittsburgh, which had its five-game winning streak snapped. Royals 4, White Sox 3 (10) • In Kansas City, Mo., White Sox reliever Jeanmar Gomez threw away a bunt in the 10th inning, giving the Royals a win over Chicago. Brian Goodwin led off the Royals 10th with a sharp double. Alcides Escobar then bunted and Gomez (0-2) made a wild toss over third baseman Yolmer Sanchez, letting Goodwin score. Rockies 13, Diamondbacks 2 • In Denver, Trevor Story hit a three-run homer during a six-run fifth inning, German Marquez struck out 11 over seven masterful innings and NL West-leading Colorado gained more separation with a 13-2 win over Arizona. The Rockies increased their lead to 11/2 games over the Los Angeles Dodgers, who lost 10-6 at Cincinnati. The Diamondbacks now trail by 31/2 games. This is the latest the Rockies have been alone atop the division since 1995. Yankees 7, Twins 2 • In Minneapolis, Gary Sanchez had three hits including a mammoth home run, J.A. Happ tossed six shutout innings and New York continued its mastery of the Twins. New York has beaten Minnesota nine straight times, outscoring the Twins 66-23. The Yankees are 20-4 in the teams’ last 24 meetings.